Marcus Ulpius Traianus succeeded to the role of Roman Emperor on this day in 98 AD. 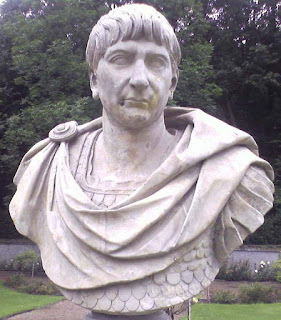 The 13th ruler of the empire and known as Trajan, he presided over the greatest military expansion in Roman history, the consequence of which was that in terms of physical territory the empire was at its largest during his period in office. Despite his taste for military campaigns - he conquered Dacia (the area now called Romania), Armenia, Mesopotamia, and the Sinai Peninsula - Trajan was seen as the second of the so-called Good Emperors to rule during the years known as Pax Romama, a long period of relative peace and stability. He was credited with maintaining peace by working with rather than against the Senate and the ruling classes, introducing policies aimed at improving the welfare of citizens, and engaging in massive building projects that were to the benefit of ordinary Romans. Marcus Ulpius Traianus was born in the Roman province of Baetica, which approximates to the area now known as Andalusia in southern Spain. His father was a provincial governor who then turned soldier, commanding a legion in the Roman war against Jews. He became a consul and then governor, successively, of Syria and Asia. Trajan served 10 years as a legionary staff tribune before being appointed to the command of a legion in Spain in 89 AD, in which capacity he was sent to help quell a revolt against the emperor Domitian by the governor of Upper Germany. Domitian rewarded him with a consulship. His rise to emperor followed the assassination of Domitian in a palace conspiracy. Domitian's replacement, Nerva, was childless but adopted Trajan as his successor as someone who seemed acceptable both to the army commanders and to the Senate. Trajan, who had married Pompeia Plotina but, in common with many among the Roman high command, had male and female sexual partners, was a much more active ruler than Nerva had been during his short reign. He immediately began planning for his Dacia campaign, remaining at his governer's residence in Upper Germany for almost a year before returning to Rome to accept the imperial powers. When he finally did return to Rome in 99 AD, he made generous gifts to the people, distributing cash handouts and giving more poor citizens free grain from the state. He reduced taxes and began a public fund for the support of poor children in the Italian cities, who had previously had to rely on donations from private individuals. He saw to it that competent and honest officials administered the provinces, with special governors appointed to provinces whose cities had suffered financial difficulties. Trajan undertook or encouraged extensive public works. Roads, bridges and aqueducts were built, wastelands reclaimed and harbours constructed. Rome, in particular, saw substantial improvements, including a new aqueduct bringing water from the north. An impressive public bathing complex was built on the Esquiline Hill, and a magnificent new forum, designed by the architect Apollodorus of Damascus, at the centre of which was a colossal equestrian statue of the emperor. New streets of shops and warehouses sprang up nearby. A court flanked by libraries for Greek and Latin books and backed by a temple was developed close to the forum. 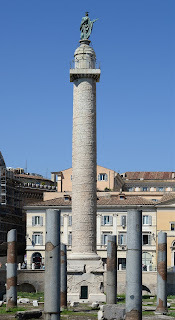 Trajan’s Column, an innovative work of art that commemorated his Dacian Wars, is still standing. Trajan's ashes were later placed in the column's cubical base. The statue of Trajan on top was removed during the Middle Ages and replaced in 1588 by one of Saint Peter. Away from his civil accom- plishments, Trajan made his mark chiefly by abandoning the policy, established by the first Roman emperor, Augustus, and generally maintained by his success- ors, of not extending the Roman frontiers. In 101, he resumed the invasion of Dacia that Domitian had been forced to abandon, creating a new province that enabled Rome to exploit rich mines of gold and salt. 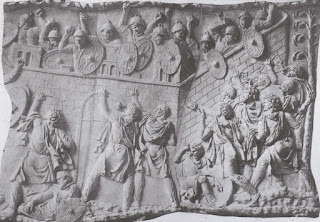 Trajan’s second major war was against the Parthians. He annexed the Nabataean kingdom, the part of Arabia extending east and south of Judaea, reinstated the pre-Roman king of Armenia previously deposed by the Parthians, annexed upper Mesopotamia and captured the Parthian capital of Ctesiphon. In 115, Trajan survived the earthquake that devastated Antioch (modern Antakya, Turkey) but not long afterwards decided to leave after revolts had broken out in the newly conquered territories. He intended to return to Rome but did not get there. Aged 64 and in failing health, he died at Selinus - now the southern Turkish resort of Gazipasa. His ashes were returned to Rome for a state funeral. Just before his death was made public, it was announced that he had nominated Hadrian as his successor. 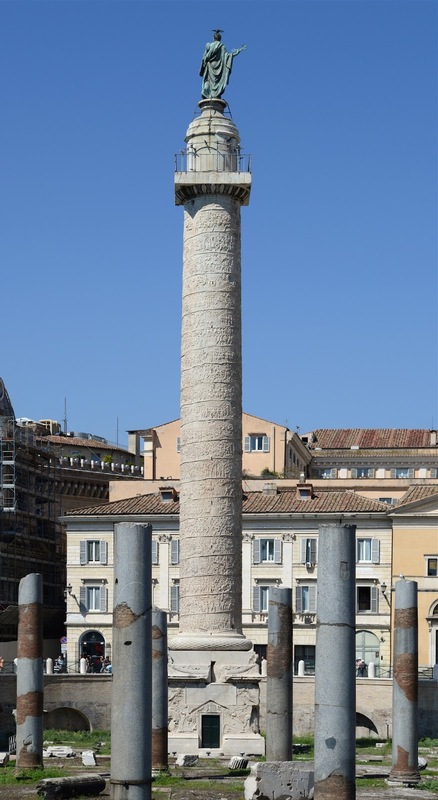 Trajan's Column is located in what remains of Trajan's Forum, built near the Quirinal Hill in Rome. The freestanding column is most famous for its spiral bas relief, which depicts 155 scenes from the Dacian Wars. Standing about 30m (98 feet) in height - 35m including the pedestal - the column is made from 20 colossal drums in Carrara marble, each weighing about 32 tons. Inside the shaft, a spiral staircase of 185 steps provides access to a viewing platform at the top. 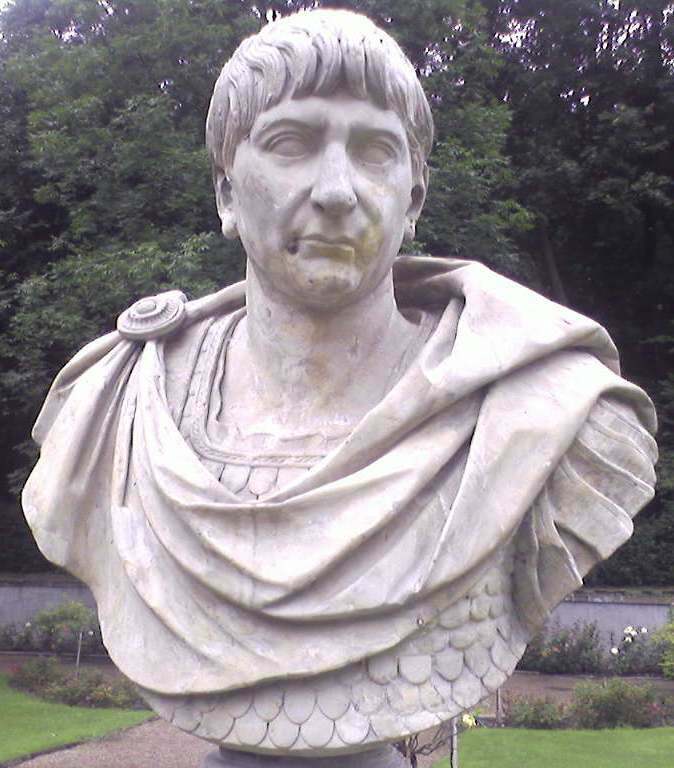 After construction, a statue of Trajan was put in place on the top but this statue disappeared in the Middle Ages. In 1587, Pope Sixtus V replaced it with a bronze figure of St. Peter, which remains to this day. Trajan's Forum, situated in Via Alessandrina, was the last Imperial forum to be constructed in ancient Rome. It consisted of a vast portico-lined piazza measuring 300m (980 feet) by 185m (607 feet), which required parts of the Quirinal and Capitoline hills to be excavated to make a flat area sufficiently large. The main entrance on the southern side was via a triumphal arch surmounted by a statue of Trajan in a six-horse chariot. 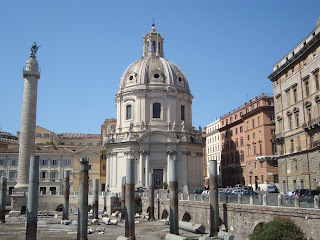 Today, only a restored section of the nearby markets - off Via Quattro Novembre - and Trajan's Column remain. A number of columns from the Basilica Ulpia which remained on site have been re-erected.